Losing 40 pounds is no easy feat. It takes time and commitment. You should aim to lose no more than 2 pounds a week, as losing weight too quickly can lead to muscle loss, fatigue and the likelihood that you'll regain your lost weight. To help you lose the weight, you need to follow a diet that limits your calorie intake without making you feel deprived. That means a diet filled with nutrient-rich, low-calorie foods such as fruits, vegetables, whole grains, lean proteins and low-fat dairy foods. 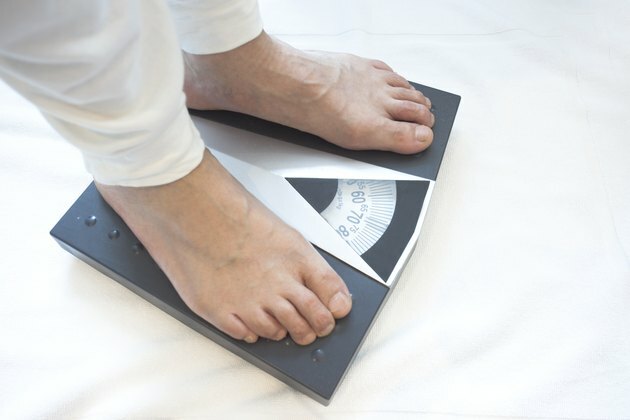 Consult your doctor before starting any weight-loss plan. To lose weight you need to eat fewer calories than you burn. Your specific calorie needs for weight loss depend on gender, age, current weight, height and activity level. Talk to your doctor or dietitian to help you determine your specific calorie needs for weight loss. Most men and women may be able to safely lose 40 pounds limiting intake to 1,200 to 1,600 calories a day, according to the National Heart, Lung and Blood Institute. Based on these calorie needs, a meal plan to help you lose 40 pounds should include three 350 to 500-calorie meals a day, plus one 100-calorie snack. Include as many food groups as possible at each meal to ensure you meet your nutrient needs. Make breakfast a priority on your weight-loss plan. Skipping breakfast may seem like an easy way to jump-start your weight loss, but it may ultimately lead to extreme hunger, overeating and weight gain. A healthy breakfast on your might include two slices of whole-wheat toast topped with 2 teaspoons of peanut butter with 1 cup of nonfat milk and a large banana for 415 calories. People tend to eat the same amount of food each day, according to the Centers for Disease Control and Prevention. To keep yourself feeling full while reducing calorie intake for weight loss, eat more low-energy-dense foods such as fruits, vegetables and lean sources of protein. These foods have large portion sizes but few calories. A healthy, filling lunch might include 2 cups of mixed greens topped with 3 ounces of sliced turkey breast and 2 tablespoons of low-fat salad dressing with 1 cup of cubed honeydew melon, five nonfat whole-wheat crackers and a 6-ounce container of fat-free yogurt for 430 calories. When you're limiting calorie intake to lose 40 pounds, you want to limit empty calories from foods such as soda, candy, cake and cookies. These types of food offer no nutritional value, and when you're eating fewer calories you want every one to count positively toward your health. A nutrient-rich dinner might include 4 ounces of grilled salmon with 1/2 cup of brown rice and 1 cup of steamed broccoli for 390 calories. Your daily snack can give you a boost of energy and aid in hunger control. It is also a good place to eat more fruits and veggies. Some 100-calorie snack ideas include 2 cups of sliced carrots, celery and cucumbers with 2 tablespoons of low-fat salad dressing; one small orange with six almonds; a 6-ounce container of nonfat sugar-free yogurt; or 1 ounce of low-fat cheese with two whole-wheat nonfat crackers. Why Is It Healthy to Eat Three Meals a Day?